federal law and Canadian provincial regulations to disconnect, reset, or alter the odometer with the intent to change the number of miles or kilometers indicated. If your fuel fill cap is loose or missing, a ‘‘CHECK FUEL CAP’’ message appears as text on the information display after you start the engine. The message appears from CHECK to FUEL, then to CAP repeatedly. Turn the engine off and confirm the fuel fill cap is installed. If it is, loosen the cap, then retighten it until it clicks at least once. You can cycle the message off of the display by pressing the select/reset knob repeatedly, but this message will be displayed each time the engine is started. It will take several days of normal driving for the vehicle to turn the warning off. If the system still detects a loose or missing fuel fill cap, the malfunction indicator lamp (MIL) comes on. Turn the engine off, and check or retighten the fuel fill cap until it clicks at least once. The MIL goes out after several days of normal driving once the cap is tightened or replaced. If it does not go out, have your dealer inspect the vehicle. 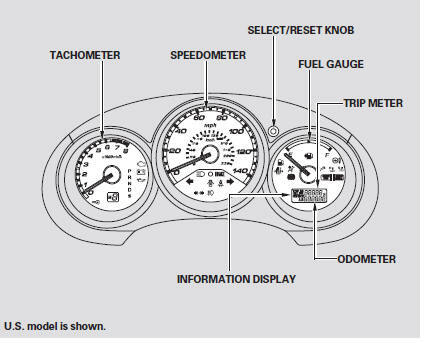 The information display in the instrument panel shows you the engine oil life and maintenance service items when the ignition switch is in the ON (II) position. This information helps to keep you aware of the periodic maintenance your vehicle needs for continued troublefree driving.